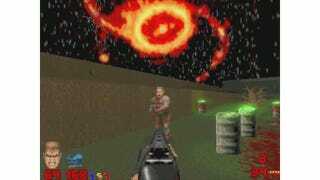 The mod for id Software's classic shooter has grown a lot since we first looked at it a year ago—if you own a copy of any of the Dooms, you should seriously consider giving it a try. It's pretty much an all-new experience. This new video demonstrates the new and upcoming v19b version's ability to splatter blood not only over the level itself—ie. the floors and the walls—but also over the so-called decorative actors, such as trees and explosive barrels. Innovative! If you want to give the mod itself a try, you can learn more here.